The Escali Aqua liquid measuring scale is a multifunctional scale with unique features. Displays not only ounces or grams, but also fluid ounces or milliliters. 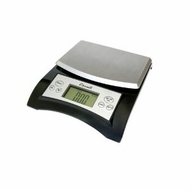 The Aqua scale can be adjusted to accurately measure liquids with different densities. Black.